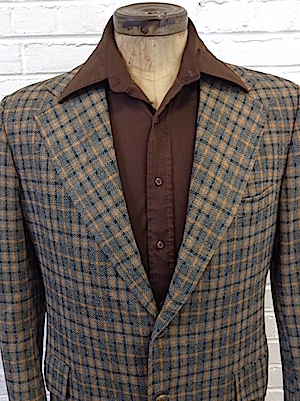 (46) Mens Vintage 70s Blazer! Gray, Green and Yellow-Orange Plaid! 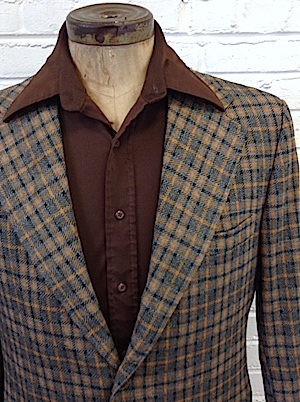 Home > Vintage Jackets > Vintage Jackets: 60s 70s 80s > (46) Mens Vintage 70s Blazer! Gray, Green and Yellow-Orange Plaid! Mens vintage 1970s disco sports jacket! Dark Gray, Yellow-Orange and Green Plaid Disco Jacket Craziness! Has a super wide, disco era collar. Closes in the front with gold colored colored buttons with fancy crests engraved in them with two matching buttons on each cuff. Has three pockets in the front of the jacket, one inner chest pocket and two lower pockets with flap closures. 3/4 lined in a dark gray acetate. Tagged by Juliliard. 100% Polyester.